Abstract. Rüppell's Weaver Ploceus galbula and the Lesser Masked Weaver Ploceus intermedius nest prominently in the Awash National Park, Ethiopia. In both species the sociality or degree of aggregation of their nesting is varied. 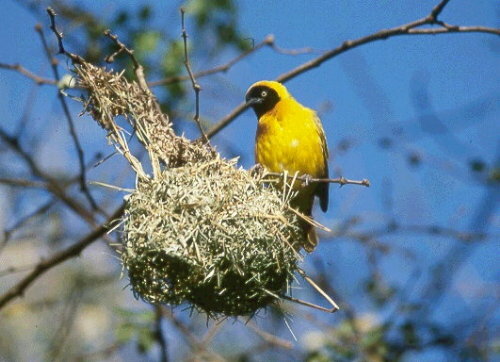 Rüppell's Weaver can nest singly or in small clusters, or in association with the Lesser Masked Weaver, which itself can nest in loose aggregations or bustling colonies. This variation suggests a continuum of nesting sociality in weavers, from solitary nesting through associative and gregarious nesting to full coloniality.